Like most people in my generation, I grew up believing that your dog will protect you from bad things. Several dogs and many years later Riley and Nissa came into our lives in 2007. Within a couple of years after that I felt like I’d been catapulted into what has turned into the biggest learning adventure of my life. It’s been one roller coaster ride after another. Some of my learning experiences have been more than enjoyable while others have been absolute nightmares. As bad as some of these times have been (and trust me – we’ve had some doozies!) I seriously don’t think I’d trade them for anything. Why? Because each and every bad thing that happened led me on yet another fur-learning adventure to a better understanding of my FurKids and for that I’m so very grateful. My new way of thinking began as a real top of the list mind-blower. During a discussion on one of the dog forums I am a member of, it was brought up that we humans should protect our dogs which is completely the opposite of what I spent 50 some years believing. After all, didn’t just about everyone who had a dog believe that the dog was the protector? I swear when I read this forum thread that my eyes were big as saucers this was such a new concept for me but I found it extremely intriguing and it’s a topic that hasn’t left my brain since. I don’t think there’s a day that goes by that it doesn’t wander through my head. If you think about it, you bring a dog or a puppy home. You feed him, care for him, train him, love him and you hopefully are not a dog owner who abuses their dog. It’s really no different than having a child move into your home. This dog depends on you for his daily needs and looks to you for everything! How could he not look at you as the source of his safety? Dogs WILL PROTECT but SHOULD They? You’ve all heard or read stories about someone’s pet dog who saved a child from an oncoming car or chased the would-be burglar out of the house. For some of these dogs their saving gesture was also their last breath because they died being a hero. As heroic as these stories are, I find them more sad than anything. There is no joy for me in a dog having given it’s life for someone. Do you really think that when the dog is saving someone that they know they could die doing it? They’re doing what dogs do and they don’t realize for even one beat of their precious hearts that they may not live through it! Riley has proven on several occasions that he will protect me. As heartwarming and comforting as this might seem, it’s very wrong in my new way of thinking. We used to walk during the overnight hours mostly because it was less likely we’d run into a loose dog. 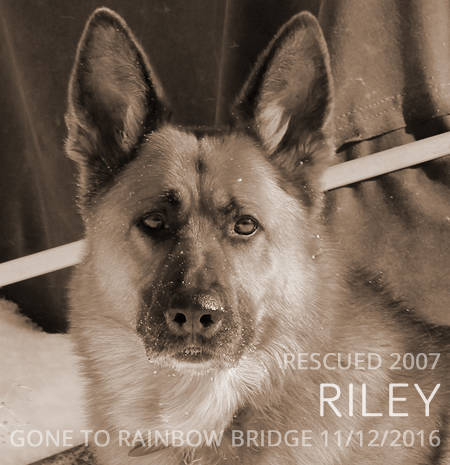 Some people thought I was crazy because of the common night-dangers in our crazy world but I felt safe — my Riley would never let anything happen to me. How freaking arrogant, stupid and heartless was that? Although it was our favorite time to walk and most anyone seeing us coming took to the other side of the street, we’ve stopped this practice for several reasons. There are more and more people with weapons on the streets. A dog is no match for a gun or knife. If someone really wanted to hurt me, Riley would put up a valiant fight but he’d lose to the bullet or the blade. How could he protect me then? How could I intentionally put him in the position that he’d feel he needs to protect me? If something were to happen we’d all lose and if I lived through it — I would never forgive myself. There’s also the fact that he’s had hip surgery in both hips which puts him at a serious disadvantage for any physical altercations. Lose dogs. If you read my Don’t Make Me Spray Your Dog article you know we have a huge problem with loose dogs in this area. I realized I have a lesser chance to see a loose dog coming at us in the dark than I do during daylight hours. Yes, encountering a loose dog in the overnight hours is lessened, but there’s no 100% guarantee it won’t happen. If I’m going to have to deal with a loose dog, I’ll take my chances when I have better visibility. Yes, dogs can and do protect and they can do a darn good job of it! BUT the point is that they should be professionally trained for the job. You got trained to do your job didn’t you? You didn’t just get hired and and have someone point you in the direction of your work station and tell you to “have at it” without telling you how to do things. 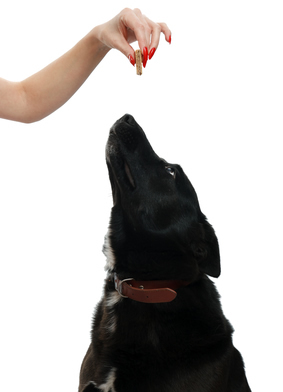 If you want a dog to protect you — you need to consider this as the dog’s job and to do the job properly your dog must be trained. 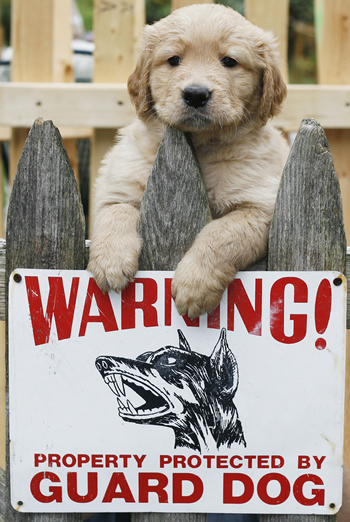 Without professional training a dog in protect mode is really a loose cannon. They’re reacting to the circumstances of the moment — they’re not acting with any degree of knowledge of what to do. They can sense you’re scared and that means so are they! Remember, fear is the number one reason a dog bites so yes! He’s afraid so he’s going to react by biting and this is what many people confuse as protection. The chances of you having any control whatsoever over a dog in protect mode who’s had no training are slim and next to none and their reaction is likely out of fear. 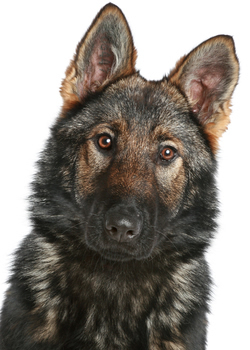 Cops can call off their trained dogs — an untrained pet dog in a frenzy is not going to hear you. If you want a dog for protection — get one that’s been professionally trained and as the owner — you need to be trained in his proper handling. The bottom line is that my dog should not have to feel he needs to protect me. It’s my job to protect my dog and for better or worse, this is the way we believe it should be. I guess I take an entirely different view on it. If the life of my dog saves my life, its worth it. I love my dog as a cherished companion, but my dog is not a child, he does not have value like a child. You’ve heard the joke of taking a fat friend bear hunting, right? Because you don’t have to run faster than a bear. You only have to run faster than your fat friend. That’s a particularly sociopathic or immoral path to take with a fellow human – but with a dog? They are not human and human socio-relations and the morality attached simply don’t enter into it in my judgement. I will sacrifice my dog’s life for mine if it comes down to that. Sorry buddy, if its me or you, its me. Every Single Time. I can get another dog. I *will* get another dog, every single time, even if they take $5000 and 5000 hours of my time to train. Its better that I be out that time and money – and plus that companionship and joy and love – AND alive – than I be dead. I hope I never have to make such a decision, as it will tear me up something fierce. But when it comes to rational decision making, I see no other logical conclusion. Thanks for sharing your thoughts with us. I believe that your way of thinking is still the majority’s way of thinking and may always be so. We moved to the other side of the fence. We’re not alone in the field but it’s a much smaller group than yours is. I hope you never have to make this decision either. I wish no one would ever have to make it. I’m not singling you out here, you are not alone when it comes to this, but I find it sad that when it comes to humans who love dogs they’re so irreplaceable are when they’re with us but so replaceable after they’re gone.